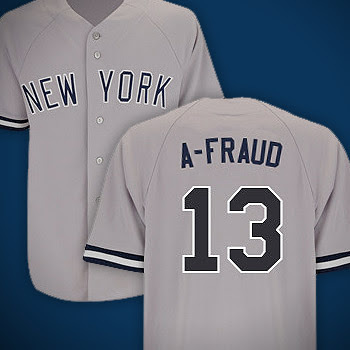 Major League Baseball has banned the name "A-Fraud" from any personalized jerseys. MLB.com spokesman Matt Gould told CNBC that the league does not allow fans to personalize products with anything that is deemed inappropriate, derogatory or profane.MLB.com spokesman Matt Gould told CNBC that the league does not allow fans to personalize products with anything that is deemed inappropriate, derogatory or profane. It seems the MLB is sticking up for A-Rod here. Although, they are probably more concerned with baseball's image as a whole, rather than just A-Rod. Apparently, fans cannot get jerseys with "steroid" on the back of them since 2005. I definitely would call this creative of the fans who want this, but I wasn't planning on getting one of these jerseys. I don't really understand who was trying to get them. I do not jeer players for any team that I root for. Do I like A-Rod? No. Would I spend over $100 to prove I don't like him? Certainly not. Well I would boo players on my team, but I would never spend $100.00 on a jersey like A-Fraud. Myself when I buy jerseys I want a Old Time Favorite on it or I would make a Jersey with my Name on it. (I have a Jets and a Tampa Bay Lightning Jersey with my name on it)..
No it does not say Nutball on it.. I'll get a real Derek Jeter jersey some day.